Go on a fun filled journey around the world and explore new cultures. Have a delightful time trying out unique cute outfits and cool accessories. No visit is complete without playing with the adorable pets. So get yourself ready for a colourful adventure where everyday you learn something about a new enchanting land. * Choose from a wide array of beautiful dresses, coats, skirts, shirts, trousers, socks and shoes. * Every culture has its unique set of local clothes and accessories. * Pick the perfect hairstyle for every occasion. * Accessorize with matching purses, glasses, scarves, hats, fans and belts. * Add text bubbles and write your own messages. * Decorate with dazzling frames and vibrant backgrounds. * Take a photo and share your lovely princess with your friends. 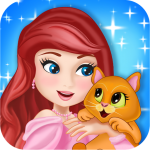 * Play with the charming interactive pets. * Unlock loads of exciting stuff. * Hours of fun for kids of all ages.